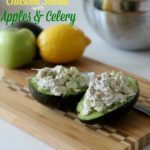 This is a healthier chicken salad recipe, and it is SO GOOD! Mix chicken, celery, and apples. In a separate bowl mix mayo, yogurt, and lemon juice. Mix well. Combine chicken mixture with mayo mixture and stir well. Add salt and pepper to taste. OPTIONAL: Slice an avocado, remove the pit, and serve the chicken salad with avocado. It's so good!